Gigi's Thimble: A Giveaway For You! O.K. I am so excited about this. 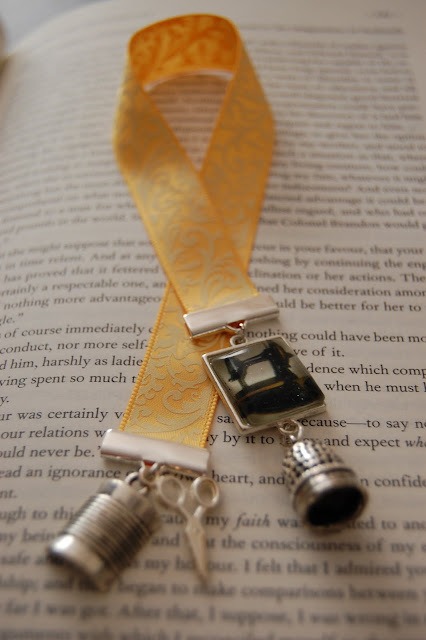 My sister Cassie has offered to give one of my readers this beautiful bookmark. It's so perfect; I just can't get over it. She had a giveaway a few weeks ago and I was one of the lucky winners. I fell in love with mine and thought they would be the perfect Teacher Appreciation gifts for the end of the year, so I ordered two for my kids' teachers. They come all ready to gift, in beautiful damask cloth bags that pull closed. So not only is Cassie, giving away one of these bookmarks to one of you, she is also offering (to all of you) $2 off any of them in her etsy shop in honor of teachers! The discount is only good until Wednesday, May 19th so she can get your bookmarks to you (hopefully) by the end of your school year. If you see one you like in her shop then send her a convo telling her which one you want and she'll adjust the price for you. This giveaway will end Friday, May 21st at Noon. I'll announce the winner shortly after that. There will be two possible ways to get entries for this giveaway. 1.) Visit Cassie's etsy shop: Between the Lines. Look at all of the beautiful eye candy in her shop. Come back here and leave a comment below telling us which one is your favorite. 2. )Become a follower of her wonderful blog, Serenade for Solitude then leave another comment saying that you're a follower. Thoughts and Prayers is hands down my favorite....although I loved them all!!! I think they're all beautifulI, I love the fleur de lis and the tree of life. I love the "Thoughts and Prayers" one. These are really neat! Thanks. 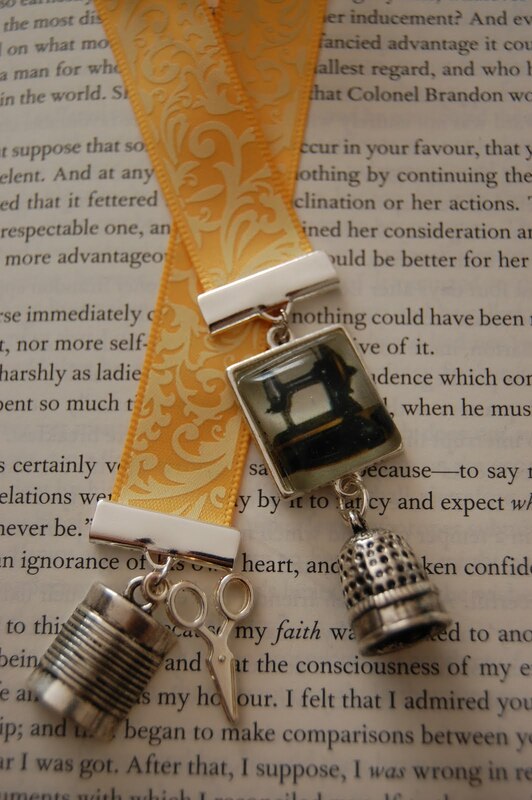 I went to Cassies shop and fell in love with the "soar" bookmark, but it's the "sewing" one I truely love. Adore the sewing theme book mark, in the shop, I love the wise owl book mark! Thanks for hosting this GREAT giveaway! The bookmark is adorable and I would love to win it.The bird pattern is adorable. Ok, I love Cassie's Etsy shop. I'm going to get some of these bookmarks as gifts! Thanks for the tip! They are all so pretty! Pink is my favorite color but I just love the sewing charms on the one here, so I'd have to say it's my favorite. Please enter me! I am partial to the sewing-theme one you show here but I also like Tree of Life. What a fun giveaway! It was hard to choose but I think my favorite is Unconditional love. I am now a follower of Serenade for Solitude! I love the wise owl one. Also the tree. I love them all. It's too hard to pick a favorite. My favorite THREE are the quilting bookmark, the wisdom/owl bookmark, and the serenity bookmark. All so pretty, and like you said, the perfect gift. My favorite in Cassie's Etsy shop is the wise owl however being a quilter, the one shown on your blog is by far my overall favorite! Any sewer will love the sewing bookmark. I absolutely LOVE it. Please enter me. I went to your sister's Etsy and they are all so cute but I would have to say my favorite is the owl. Too cute. I became a follower of her blog, too. Thanks. I have been following her blog for about two months... at your recommendation! :) Thanks! Wow....your sewing bookmark is absolutely gorgeous! I also like her owl one. I am following her too. I like the Wise Owl. Those are so pretty! I think when my daughter graduates from college for teaching, I'll get her one...:) She loves books almost as much as I do! Thank you for having such a sweet give a way. I think my favorite is Unconditional Love, but it was a hard choice, they are all so lovely! My favorite is the sewing one on your blog. But in her shop I love the wise owl! What a great idea! What a great giveaway! Became a follower of both of you girls! What talent! Oh, the wise owl is my favorite! These would be great teacher gifts. I just became a follower of your sister's blog, I enjoyed the photos of her little tyke. I would love to win a bookmark. what a great giveaway. I just became a follower of your sisters blog. as for about the one I like most, I could not tell they are all so awesome. They are all lovely, it's really hard to pick my favourite, I think I'll say "Soar". follow your heart was one of my favorites. Good Morning. You may want to drop by my blog this morning ... hint hint hint. I love "thoughts and prayers"... I'm following both of you, such talented sisters! They are all beautiful, what a creative idea. My favorite is the Wise Owl. I love the Follow Your Dreams design! My favorite is the The Owl!! My favorite one is the one over here with the sewing charms .... but over there I fell in love with the one with the owl. I also liked the one with the leaf at the very bottom of the page. I bookmarked her etsy shop because I intend to go back when I have more $$ than I do now and buy some for gifts. I am now a follower of Ms. Cassie's blog. amber - so so darling and wonderful. What a great giveaway. something everyone would love having. I like trust in your dreams at her between the lines store, they are all very cute! I hope I win the sewing one! Thanks! I'm now a follower of her blog! I like the "Tree of life"
I went to Cassie's shop and I love the Fleur de Lis.. I ordered one of Cassie's bookmarks. Hopes and Dreams. It came in the mail today and I LOVE IT!